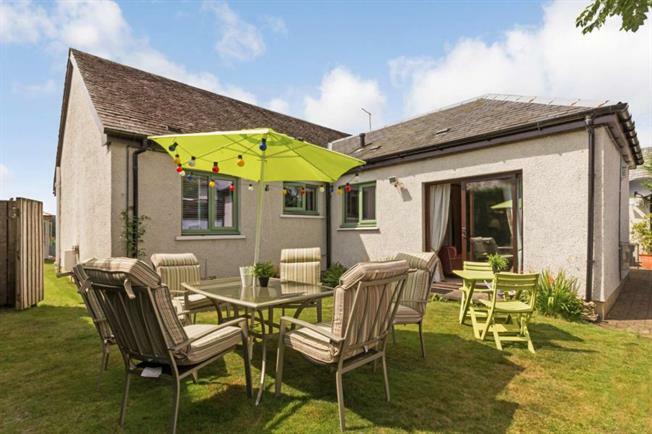 4 Bedroom Detached House For Sale in Callander for Offers Over £290,000. A stunning individually designed detached villa which has been modernised and upgraded by the current owner to an exceptional standard. Corriemar is situated within an attractive south facing plot and benefits from fabulous views to Ben Ledi and surrounding countryside. The property is well placed for all amenities and major road networks allow ready access throughout central Scotland. Surrounding the property are neat and well established garden grounds which enjoy a high degree of privacy and have been designed predominantly for ease of maintenance. A gated entrance gives access to an extensive driveway which provides ample off street parking and turning space while giving access to a large garage with electronic roller door and power and light installed. Internally, the versatile living accommodation comprises on the ground floor: reception hall, lounge with feature lime stone fireplace with living flame gas fire insert, dining room/bedroom 4, stunning open plan dining kitchen, w.c., sitting room with a cosy top-of-the-range gas fired log burning effect stove and patio doors to a private courtyard style area of the garden, double bedroom and attractive bathroom with shower. Upstairs there are 2 further double bedrooms, both with en-suite shower rooms and excellent storage. All rooms are impeccably appointed with fresh tasteful decor complimented by quality fitted floor coverings which are included in the sale. Specification is to an un compromising standard including quality kitchen bathroom and en-suite fittings, warmth is provided by a gas fired central heating system and double glazing is installed.